Podiatrists have a saying 'If your head aches, it could be your feet!' (not so strange as it sounds). Briefly, excess pronation occurs when the foot is allowed to 'roll over' on to the inner border and the arch of the foot lowers, this in turn causes the lower limb to rotate inwards and so causes the pelvis to tilt forward. This chain of events can be the cause of knee, back and neck pain and sometimes even head ache. These problems can be rectified and by re-adjusting the foot throughout the gait cycle. 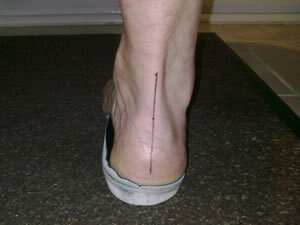 To achieve this requires a 'Bio-mechanical' assesment and custom made innersoles (Orthotics) being prescribed. 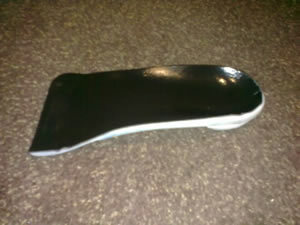 These devices adjust the angle of the foot and restore the arch profile.